← What Industry Do You Want to Use Your Language Skills In? How Do I Illustrate My Strengths on My Resume? 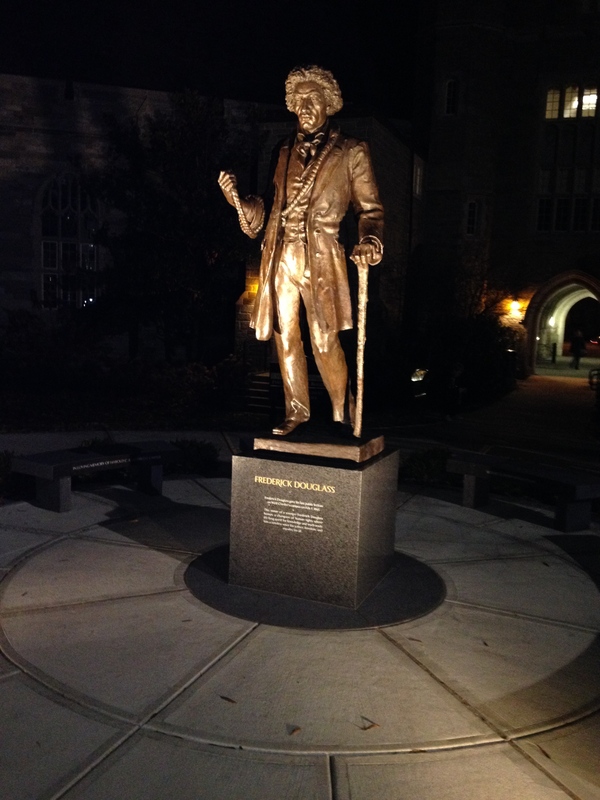 Frederick Douglass statue on West Chester campus, site of his last public lecture. You know that’s what you have to do, but how? It’s easier said than done! Here are a few examples that mostly come from my campus visit to West Chester University last November. That’s a great start, but it doesn’t tell potential employers anything specific that they can use to judge your suitability for employment. Ask yourself, what did I do while abroad that proves I lived like a native? planning and executing own trip to Costa Rica. Here are some resume lines that show you lived like a native while abroad. After: Respiros Yoga. Madrid, Spain. Fall 2011. Only non-native Spaniard in 12-week advanced yoga class. After: Los niños felices. San José, Costa Rica. 2012. Designed and executed weekly lesson plans for 18 ESL students aged 8-11 in after school program I set up in collaboration with school administration. After: Costa Rica, summer 2013. Planned and executed own trip to Costa Rica, independently navigating the country while backpacking solo. The resume lines have to be short and sweet, but then you want to be ready with a follow-up that you could use in a cover letter or job interview. The focus of your follow up will depend on what the employer is looking for; and you can find that out by reading the job ad carefully, looking for keywords, researching the company online, and asking anyone and everyone who knows anything about the company or the position for information. Remember this important strategy while abroad: take something that you like to do anyway and find that community of like-minded people in the new place. In this case it’s yoga, but it could be chess or volunteering in schools or knitting–whatever you are already good at and comfortable with should be your entrée into a new community of like-minded people. You can then use that experience to show that you have almost every soft skill employers are looking for in a new hire. The example of the ESL gig also shows that you are independent, resourceful, and take initiative. But think about this: it could be used as “program development” experience if that were a requirement for a job. When you see keywords in job ads and think, “bummer! I don’t have that experience, but otherwise it’s a perfect job for me,” stop and think through ways in which you do have the necessary experience, but just haven’t ever thought of it in terms of the exact key words from the job ad. If you developed an after-school ESL program and took the initiative to present it to school administration, then executed the program during your entire year abroad, that is program development. Drawing on specific examples from your own independently-designed abroad experience (backpacking through Costa Rica), you could illustrate almost any professional strength–from program design to troubleshooting to reacting to a crisis. You just have to find out what the employer is looking for, then you choose a compelling story from your trip, tell it (in writing or in an interview), say what key things you learned from it (using the language the employer has used in descriptions of the qualified candidate), and say how you will apply it to your new job in that company. What is your example that shows you lived like a native while abroad? Post it here in the comments or on Facebook. Seeing others’ ideas will help you remember your own experiences that might be relevant.